Paul Conroy is trapped in a coffin, buried underground. Made for anyone who likes a good thriller should love this movie. 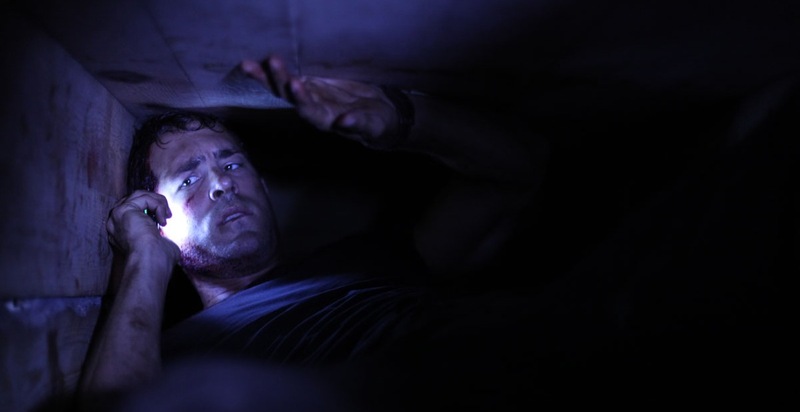 Paul Conroy (Ryan Reynolds) has been kidnapped and buried under the ground in a nondescript coffin. He’s got a cell phone, a lighter, and a pencil with him. Paul is a contractor working in Iraq. He wakes up, trapped in a wooden box. The kidnappers gave him the cell phone so he could record a message, which they are going to send to Paul’s employers hoping to get a sizable ransom for their employee. Let me be clear, the entire runtime of Buried takes place inside Paul’s makeshift coffin as he desperately tries to escape. Although we hear other voices on the phone as Paul talks to different people, Reynolds is the only actor on screen here. This makes for an interesting dilemma. Can a movie starring one man in a box be, gulp, exciting? Director Rodrigo Cortés, with the help of writer Chris Sparling, create an inherently creepy and claustrophobic thrill ride that will keep you entranced. It’s hard to believe a movie about a man stuck in a box will be able to hold your attention, but it does. It moves along at a frantic pace, because Paul only has around 90 minutes of oxygen before the rest of the air inside the tiny coffin is not breathable. The reason Buried works is two-fold. First, Cortés’ direction is brilliant. He’s able to get some unbelievable shots during Paul’s entrapment. You wouldn’t think that a human-sized box would hold many angles to film, but it does and Cortés uses them all. The second reason why the movie succeeds is Reynolds giving what amounts to his best performance in his career. This is not a performance that any actor would take lightly, but it’s also a performance that I don’t see many actors jumping at the chance to do. Reynolds spends the entire time in a box where he can barely lift his head up, or turn over. At times during the film you actually feel like Reynolds is trapped and has no way out, even though with movie magic we always know that at least one side of that coffin isn’t attached in order to let the camera film. Reynolds breaths heavily, swears, and freaks out. Pretty much exactly what all of us would do if we found ourselves in that situation. Buried is a movie that must be seen in a large, dark theater to experience the full effect. I can’t see its home video presentation harboring the same claustrophobic feeling that you get sitting in a dark theater watching a man struggle by way of fire light and cell phone glow to get out of a tiny box buried in the earth. It’s truly an exhausting movie as an audience member. You feel like you’re right there with Paul, experiencing his hopelessness and frenzy.